Nurturing with Rhymes is a free eight-week program designed for parents or caregivers and their young children. Rhymes, songs and stories are taught in a setting that encourages fun and language development. I attended a Nurturing with Rhymes session in the spring of 2010. Baby J and I were thrilled to learn some new songs and connect with other moms and kids in this well-organized, hour-long class. We certainly found the atmosphere to be relaxed and welcoming. Parents and children sit in a circle and are led in rhymes and songs. Light snacks were provided during a short break, and I welcomed the opportunity to mingle with the other parents. "Over time I have been able to see how Nurturing with Rhymes can be a valuable part of a week for parents and caregivers," said the program's creator and leader Sharon Bâby. "Gathering together with other parents helps them feel a sense of belonging." Through most of the hour, Baby J was intrigued by the activities going on inside the circle. However, I appreciated that a childcare assistant and a toybox was available, so when his attention span led him outside the circle, I was able to remain and learn the new songs. Parents are provided handouts of the songs and rhymes. On the final day of the session, each child was also given a new children's board book to take home courtesy of CanWest's Raise-A-Reader initiative. 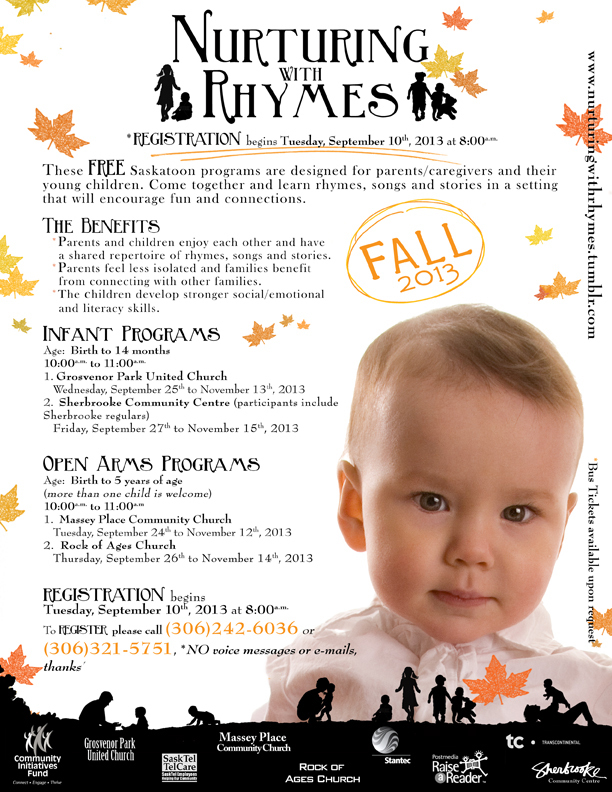 Click on the poster above for details about the Fall 2013 Nurturing with Rhymes programs. 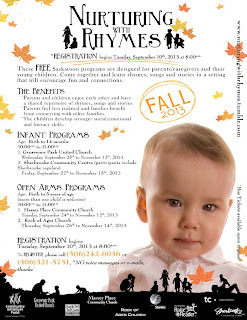 For more information, or to register after September 10, call Sharon at 306-242-6036.